Plastic body with 16" lanyard. 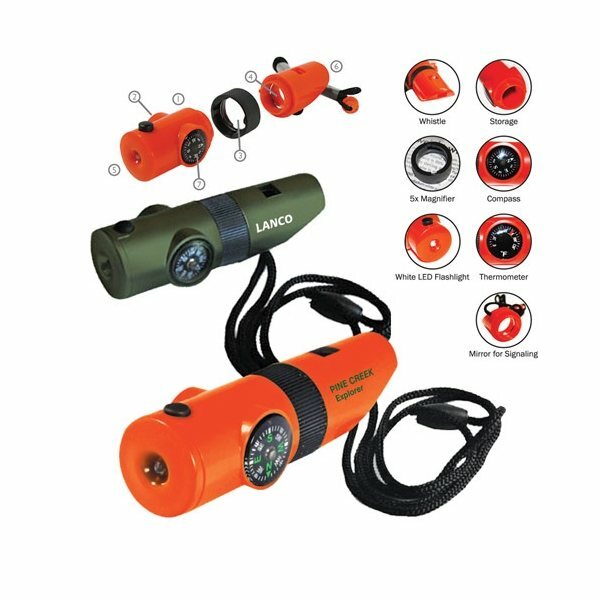 7 functions include whistle, thermometer, magnifier (5x), signaling mirror, LED flashlight, compass, & storage tube. Great for camping, hiking, fishing, and other outdoor activities. Powered by 2 CR2016 batteries (included). this was my first order with AnyPromo for exhibit booth give aways. Ordering process was quick and easy and I was really surprized at how easy it was to load in our logo and/or set a text design on the item. Very cool. Very durable and nice quality. They were a large hit in the trade event where we handed them out. the overall product was quite nice Precisely what I was expecting…large logo design. Your staff was the best while working with us as we were making our selections and how to complete our order as we were getting the best amount of product for our money.